Before I joined Science Centre as an intern/temporary staff, words like “maker” and “tinkering” were at the bottom of my word bank. An Arts student like me saw the beauty of Science through simple activities like “Paper circuits” and “Bristle bolts”. I saw the pure Physics that I painstakingly studied in secondary 4 come alive. Barely 3 weeks into work and I feel that if I had been introduced to ‘Making’ since young, I would have been a more creative person who thinks out of the box. The life of kids these days revolves around academics and the computer. They are given very minimal opportunities to hone their thinking skills but these are the kind of workshops which create innovative people. 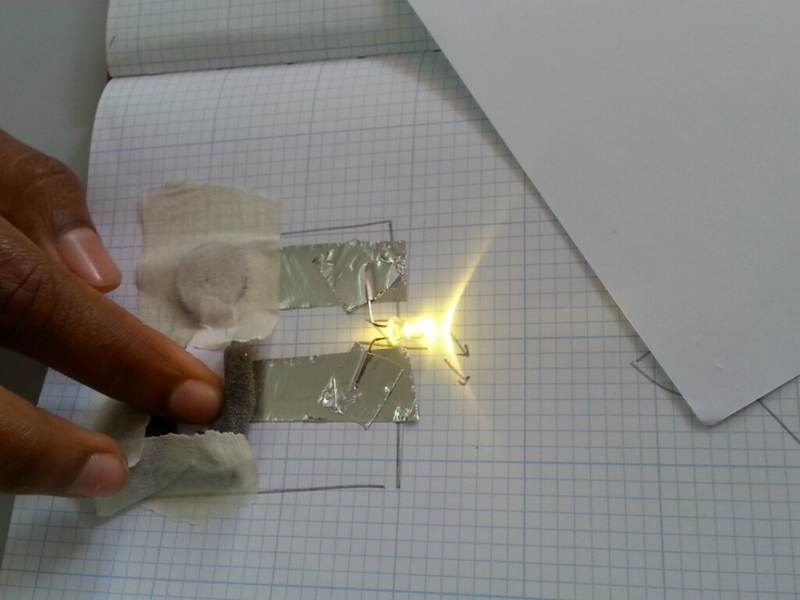 While explaining to me what paper circuits are and how to make them, Dr Kiruthika made the paper circuit above. How many of us know that aluminium foil and aluminium tapes are alternatives of wires, because they conduct electricity? There is a huge gap between practical and theory. Students who attended the Pop up Maker space at Poi Ching Primary School used that simple concept of electricity and made interesting things with it. 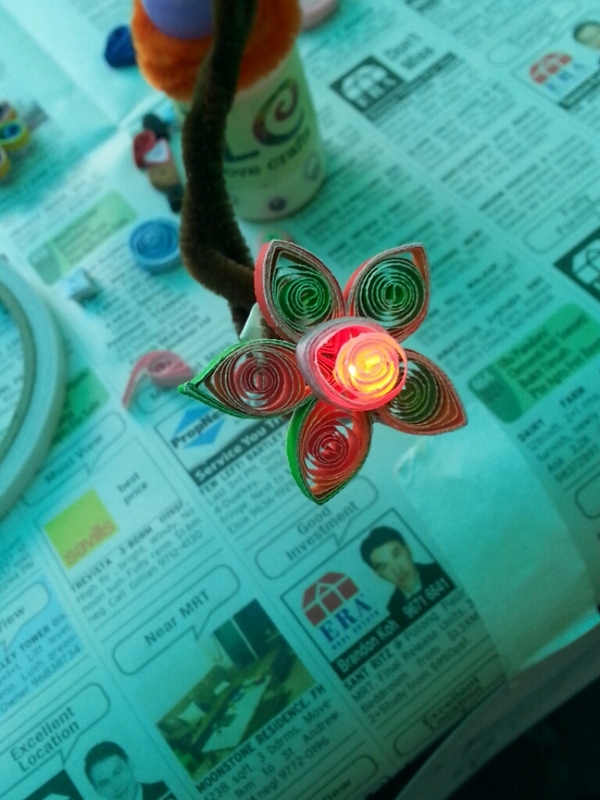 Another maker, Priyanka Gupta – founder of Just Love Crafts, came down to Tampines to teach the bursary award recipients quilling. Making is just so beautiful, it really feeds one’s soul. Moreover, quilling is not only for relaxation purposes ,it is useful as anything from decorative items to jewelry can be made using paper. Yes, you read it correctly, PAPER. 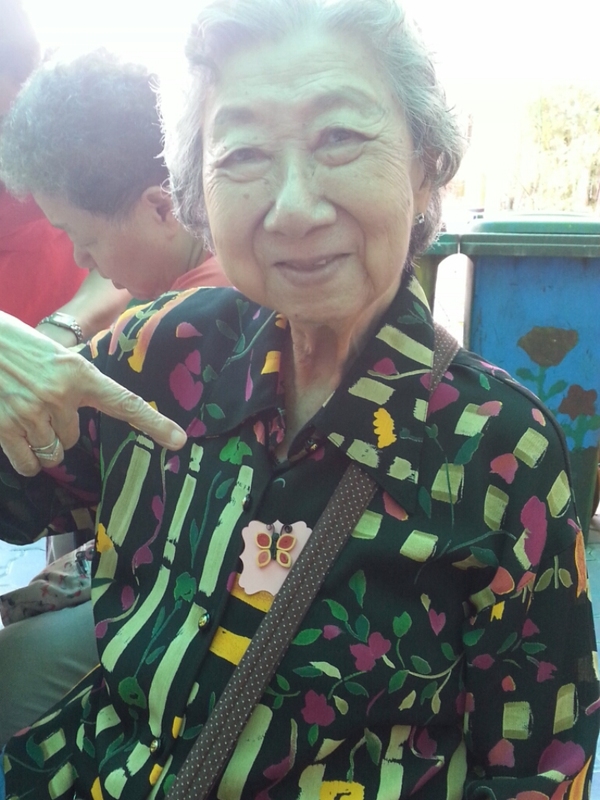 I saw the joy in children, parents and grandparents when they made items by themselves. It was my pleasure to see people’s face light up upon making their own items and learning things which are not in their textbooks. 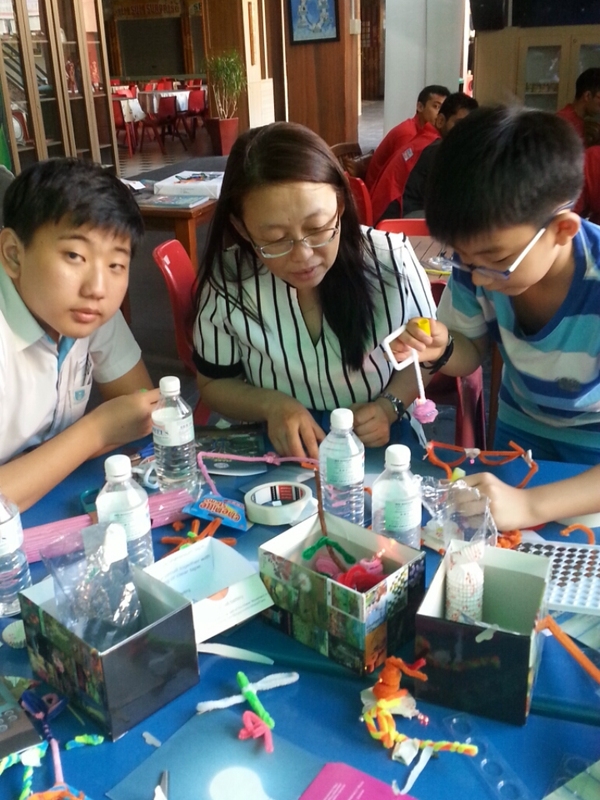 The pop up makerspace at Poi Ching Primary school was a real eye opener for me. Last December, over 1500 people came together at Science Centre to participate in HourofCodeSG. The week long coding event was facilitated almost completely by volunteers and members of the Maker community. 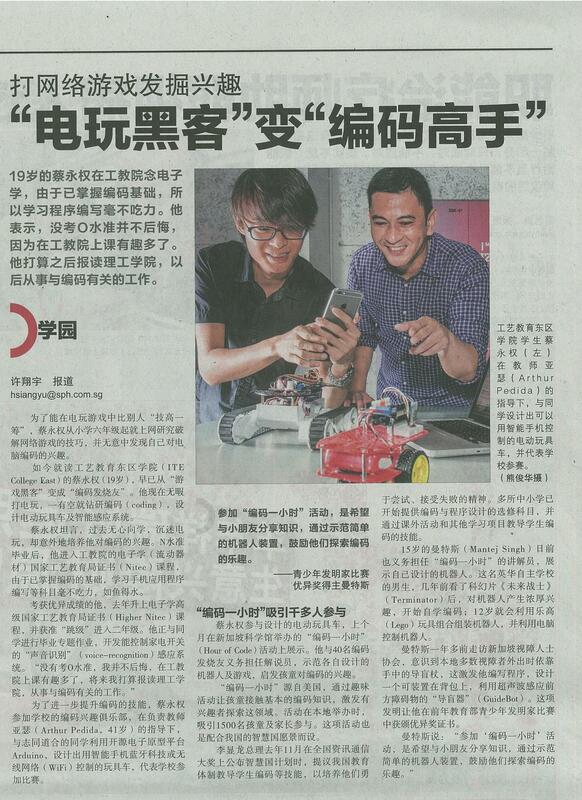 We are glad to share Lianhe Zaobao’s coverage of the event, as well as two student makers – Shaun and Mantej- who showcased their coding/ robotic creations at the HourofCodeSG. In order to be better than others at computer games, Shaun Chua, picked up the skills for cracking online games, and inadvertently became interested in coding. The Higher Nitec student now no longer plays online games, but sends his free time coding to create electric toy cars and intelligent sensing system. 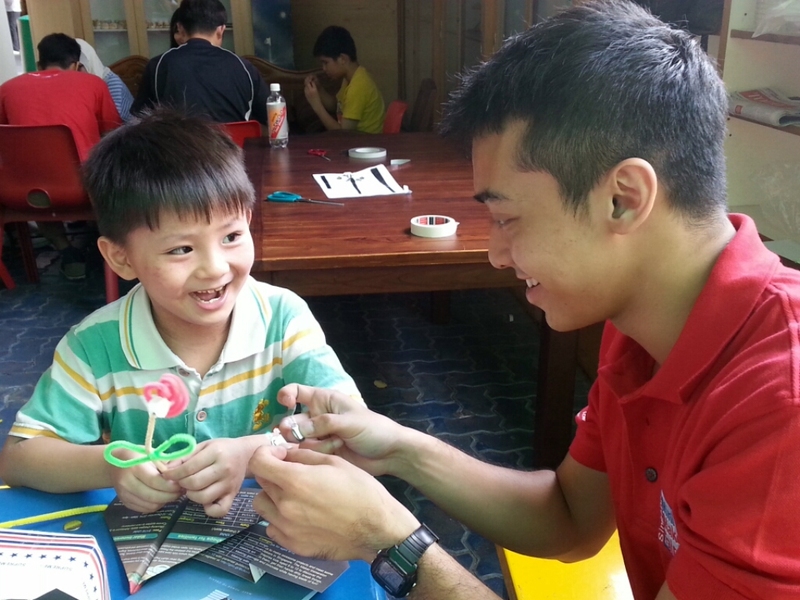 Shaun recently participated in Science Centre Singapore’s Hour of Code. He and 40 other volunteers demonstrated self-created robots and games, to interest children in coding. The event, attracted 1,500 children and parents. 15-year-old Mantej Singh was also a guide at Hour of Code, where he showcased his own robots. The ACS (Independent) student developed an interest in robotics after watching Terminator. At the age of 12, he was able to create robots using Lego toys that are controlled by computers. 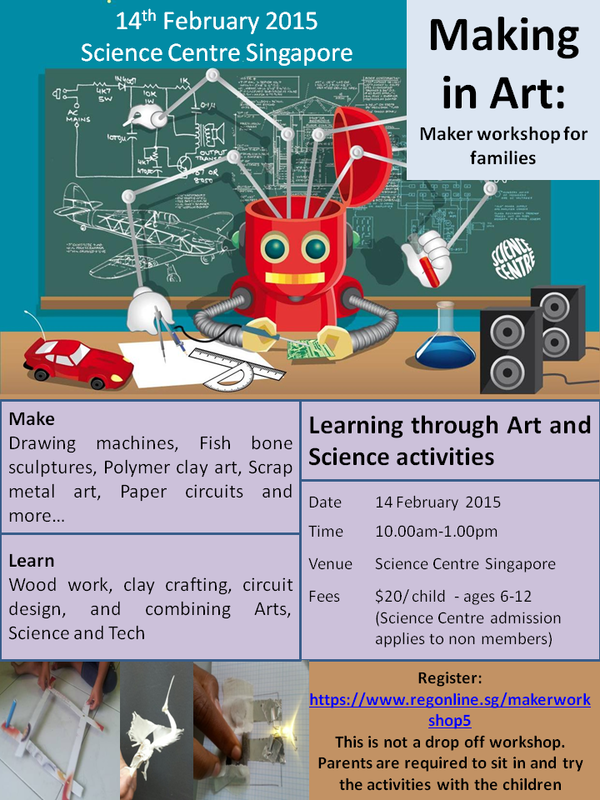 Join us on Feb 14th to make Drawing machines, Fish bone sculptures, Polymer clay art, Scrap metal art, Paper circuits etc and learn new skills such as Wood work, clay crafting, circuit design, and combining Arts, Science and Tech.